Malice at the Palace was “the most infamous brawl in NBA history. With less than a minute left in the game, a fight broke out on the court between several players. After the fight was broken up, a fan threw a drink from the stands at Pacers player Ron Artest while he was lying on the scorer’s table. 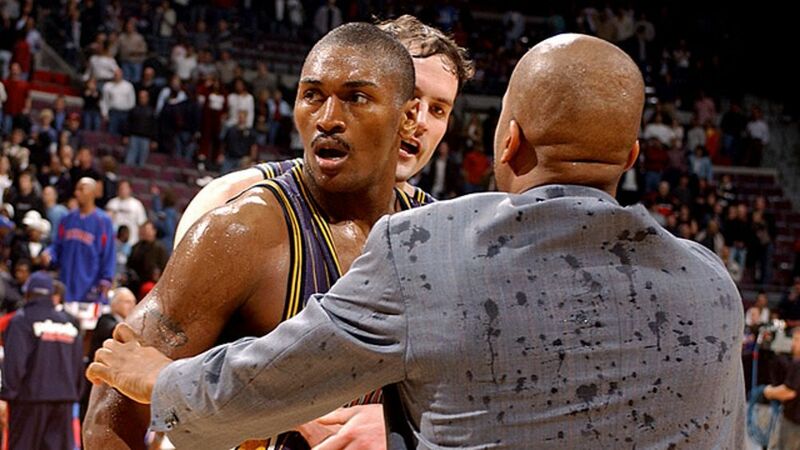 Artest then entered the crowd and sparked a massive brawl between players and fans that stretched onto the court. Malice at the Palace was the most infamous brawl in NBA history. With less than a minute left in the game, a fight broke out on the court between several players. After the fight was broken up, a fan threw a drink from the stands at Pacers player Ron Artest while he was lying on the scorer’s table. Artest then entered the crowd and sparked a massive brawl between players and fans that stretched onto the court.After the game, the NBA suspended nine players for a total of 146 games, which led to $11 million in salary being lost by the players. Five players were also charged with assault, and eventually sentenced to a year of probation and community service. Five fans also faced criminal charges and were banned from attending Pistons home games for life. After the game, the NBA suspended nine players for a total of 146 games, which led to $11 million in salary being lost by the players. Five players were also charged with assault, and eventually sentenced to a year of probation and community service. Five fans also faced criminal charges and were banned from attending Pistons home games for life. This insane brawl will be re-lived in its entirety on May 31, as Showtime plans to air the entire thing as part of a documentary detailing the life of Ron Artest aka Metta World Peace.